This morning I was heading in to the office with beltzner when out of no where a woman parked on the street tried to make a U-turn through my car… Mike and I were wearing our seatbelts and are OK. 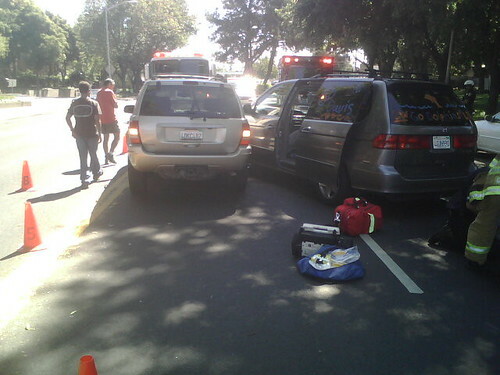 They took the woman driving the van away in an ambulance (she wasn’t wearing her seatbelt) for what the police said were precautionary reasons. The police ruled that it was the other drivers fault and fortunately she had insurance so now I get to deal with her insurance. All in all, 2 police cars, 2 firetrucks, 1 ambulance, 2 sad cars. 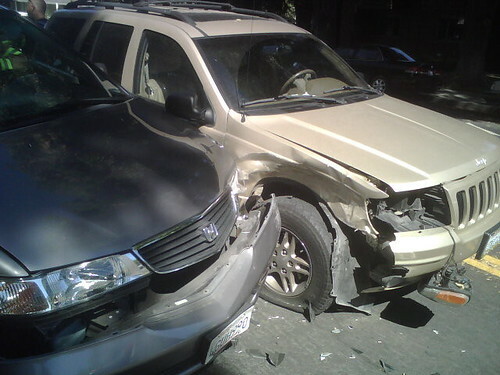 This entry was posted in Cars and tagged accident, Cars, jeep, minivan on July 20, 2007 by stuart.